Los Angeles (November 7, 2018) – Illumination Entertainment’s “Dr. 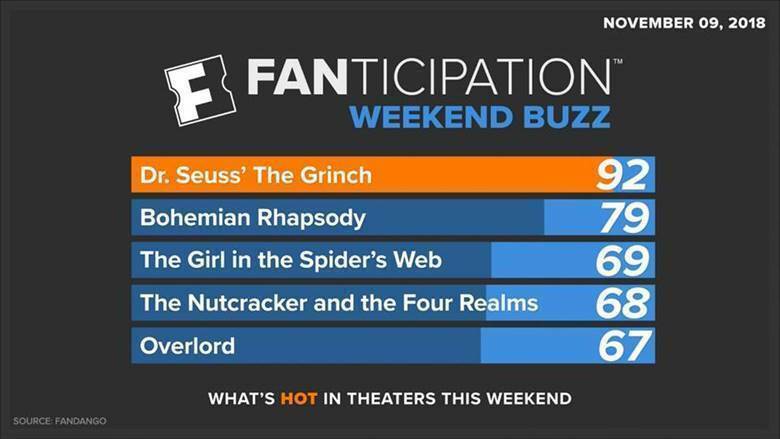 Seuss’ The Grinch” is stealing the top spot on Fandango’s movie buzz index, Fanticipation, grabbing 92 out of 100 points. “The Grinch” leads Fandango weekend sales and is outpacing Illumination’s 2016 holiday release “Sing” at the same point in the Fandango sales cycle. 89% are excited to hear Benedict Cumberbatch as the Grinch. 87% look forward to Pharrell’s narration. 71% plan to bring the entire family. 60% have seen all of Illumination Entertainment’s movies.